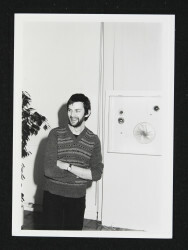 Black and white photograph of Michael Brennand-Wood, Roger Oates and an unidentified person standing in front of Michael Brennand-Wood's work at the Crafts Advisory Committee exhibition 'Michael Brennand-Wood: Thread Collages and Caroline Broadhead: Jewellery', held at the Crafts Advisory Committee Gallery from 1 February to 24 March 1979. Photograph likely to have been taken by Morris Latham. 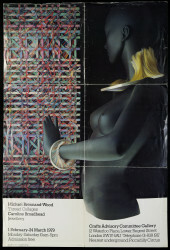 Photograph, 'Michael Brennand-Wood: Thread Collages & Caroline Broadhead: Jewellery', Morris Latham, 1979, Crafts Council Collection: AM228.